Image: From UN.org – LIFG, who is now leading, arming, and funding (via Qatari, Saudi, Turkish, US, and British cash) entire brigades of the so-called “Free Syrian Army,” is clearly listed as an integral part of Al Qaeda, with the UN noting several prominent LIFG terrorists occupying the highest echelons of Al Qaeda’s command structure. These resolutions reflects other reports previously covered, including the US Army West Point Combating Terrorism Center report, “Al-Qa’ida’s Foreign Fighters in Iraq” (summary here). 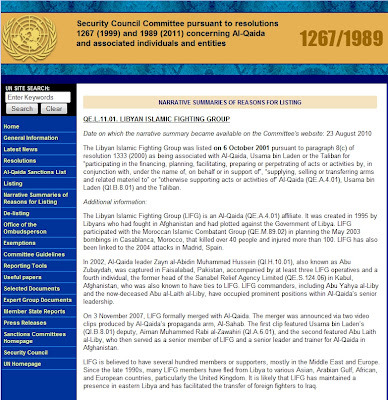 The “Free Syrian Army” is Al Qaeda, led, armed, funded by Western-backed LIFG terrorists. 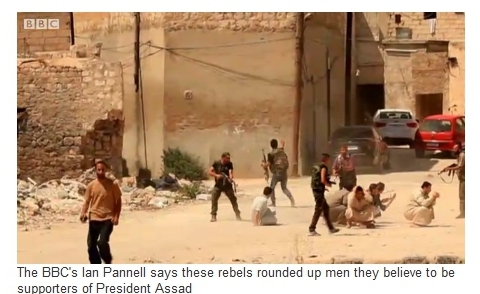 Image: From BBC’s Ian Pannell who also accompanied terrorists across the Turkish-Syrian borderand into Aleppo, he reported young men “suspected” of being “Shabiha” being rounded up as the FSA “seeks revenge.” BBC fails categorically to explain how NATO-backed terrorists can “liberate” a city that is admittedly pro-government – but it appears it will be done through terrorism, brutality, mass murder, and intimidation.